Concise details on the Mont Blanc hiking tour – Southern Half can be obtained by downloading the tour pdf [right]. Alternatively, read the tour description below and click through the sub-headings in the right-hand column for information on getting to Chamonix (the starting point), accommodation, prices and what’s included. See our great new feature: view a Relive Video of each day’s walking – scroll down to see the detailed day-by-day tour itinerary below and enjoy this latest fascinating insight. 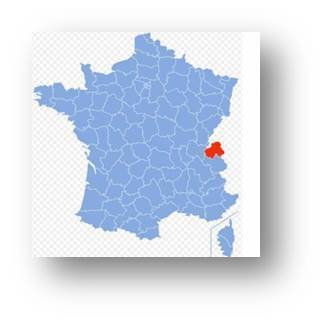 ont Blanc hiking tour – Southern Half is the second half of our TMB extravaganza. Equipped with our unique walking notes, you set off from Chamonix [where you left off last year?] and continue your anti-clockwise tour around the Mont Blanc Massif route, closing the spiritual circle at Courmayeur, Italy, six days later. Mont Blanc hiking tour – Southern Half helps you realise that rite of passage that you felt you just had to achieve, irrespective of your age, before you move onto the next goal on life’s wish-list. Can I do it? Yes, you can! The TMB attracts all sorts of people and some have never been on a walking holiday in their lives. Such is the trail’s magnetic attraction, some punters simply loose their common sense. You, of course, do not fit that mold. However, should I do it after walking The Enlightened Traveller’s northern TMB mini-Tour? Yes, we believe you should – unless, of course, you plan to walk the whole tour with us in one go. Why? Two reasons: firstly, it’s more difficult [‘challenging’ as opposed to ‘quite challenging’]; secondly, it takes you into more remote and rugged areas, with the attendant dynamics. In fact, we recommend you read these tour details in conjunction with those contained in our [Courmayeur to Chamonix] TMB mini-tour. Enjoy four days in France and two in Italy. Stay in the best accommodation available and experience a night in a private room in refuge Elisabetta. Start in vibrant Chamonix and finish in idyllic Courmayeur. Walk the Balcon du Sud and the remoter southern section. Self-guided, 7-night, challenging trip, round the bottom half of the Mont Blanc route. Luggage transfers from start to finish – one case up to 20 kgs per person. Start any day from 25th June to 9 September. Average 6 to 6½ hours and 10½ miles/17 kms a day. Tour starts in Chamonix [France ]and finishes in sumptuous Courmayeur, Italy [just 30 mins from Chamonix, France via the Mont Blanc tunnel]. Convenient access from France, Italy or Switzerland. Carefully-selected accommodation of a high standard, with private rooms [no ‘dortoirs’/dormitories] throughout and en suite facilities the norm – except for one auberge and the one refuge in which you stay. 5 evening meals – leaving you free to choose where to purchase lunch en route and dinner in towns where options are available – fully documented in tour dossier. Emergency telephone help-line service with native-English speaking backup. ¹ one case up to 20 kgs max. weight. Due to the popularity of Chamonix, the options for getting to the resort are plentiful. You spend your first night in Les Praz de Chamonix, one stop [5 minutes] on the train from Chamonix, so that you wake up right next to the cable car for the start of your hiking the next day. Spend your arrival day in Chamonix and sleep with the peace of mind that you are exactly where you want to be on the morning of Day Two. Courmayeur can also be reached by bus via daily services from the main cities of northern Italy Turin, Milan, Genoa. By Train – The Mont Blanc Express: This SNCF railway line serves all villages from St Gervais-le Fayet to Martigny (Switzerland) via Servoz, Les Houches, Chamonix, Chamonix Les Praz, Argentière and Vallorcine. Our customers recommend RailEurope.com for research and ticketing. 1. Geneva International Airport, with onward connections by train [hourly via Martigny] or bus [via the SAT bus company] or via airport transfer. 2. Lyon International Airport, with onward connections by train [via Annecy]. A fine and varied mix of undulating trail through alpine pasture and along broad ridge. Morning climbs and late-afternoon descents are the norm. We have dissected this half of Le Tour into the most practicable stages possible. Once again, our aim is to get away from ‘Les Crowds’ by not starting in Les Houches. Moreover, we cut out the avoidable pain of the monotonous climb on tarmac and ski slope that characterizes the Les Houches to Col de Voza section [first thing on Day 3 and 4] and, instead, replace it with the ‘telecabine’ to Bellevue. This also allows you the luxury of delaying the choice until you are ‘up there’ between the all-weather Lower Route, or the fine weather Higher Route via Miage to Les Contamines – these two routes are extremely diverse and interesting in their own right, thus our decision to offer both options in this mini-trip. Although you would need to carry both notes! The Les-Contamines-to-Les-Chapieux section is exhilarating, if long and challenging – the variants being uninviting and NOT all weather. Mont Blanc hiking tour – Southern Half sees you enjoy an overnight stay in the Elisabetta refuge which, for most, will be the only refuge you ever get to stay in – so enjoy the simplicity of the rustic hut and its magical location in Vali Veni. Day 1: Arrive in Chamonix Les Praz [France] and hotel check-in. You are one stop from busy Chamonix, so can enjoy the town itself and sleep in peace and quiet just two minutes walk from the La Flagère cable car. Walk out the hotel, take the cable car up to La Flagère and get straight into the TMB action: le Balcon du Sud, the splendid col du Brevent, the magnificent panorama from Brevent itself and the descent to Les Houches via Le Merlet. Avoid the knee-crunching and monotonous climb by taking the cable car up to Bellevue and, depending on the weather, and your mood, opting for the trail that suits you to Les Contamines – the High or the Low Route. You will walk both, but in your order of preference. Short bus ride to Le Fayet (regular service) and onward short hop on the Mont Blanc Railway back to Les Houches – see map. Second night in Les Houches. Again take the cable car up to Bellevue and then follow your alternative trail to Les Contamines – the High or the Low Route. Follow the Bon Nant Torr past Notre Dames de la Gorge and two refuges en route to the Col du Bonhomme and Col de la Croix. Lunch in the refuge du Bonhomme is followed by the descent to Les Chapieux and your welcoming auberge. The Vallee des Glaciers is a joy to behold. Enjoy a quick drink at Les Mottets before climbing up to the Col de la Seigne and into Italy. The views are delightful as too is the descent into Lex Blanche. Your final day takes you further down the Lex Blanche before ypu climb up past abandoned farmsteads overlooking the remains of the Miage Glacier. The balcony trail to the Col Checrouit makes for a fine end to this superb hiking trip. 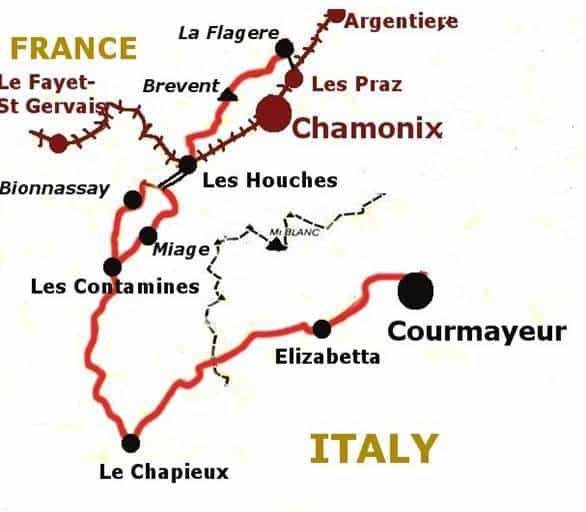 Day 8: Departure day – breakfast and onward journey by bus to Chamonix, Milan or Turin or transfer to Geneva – please ask us for details.